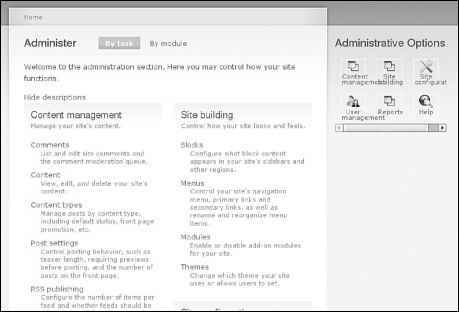 Control Panel is a module that creates a series of icons for the administration of your Drupal installation. It matches the administrative URL from a menu onto a graphical icon. A control panel can be built from any Drupal menu. With the Control Panel module, a full-page option is created and can serve as an alternative to the administrative home page (Figure 8.13). To implement this approach, replace the existing link to the Admin page with a link to the control panel. 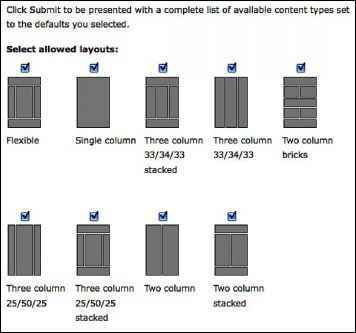 You may also choose to create a block from any menu and place it in any region of your Web site. 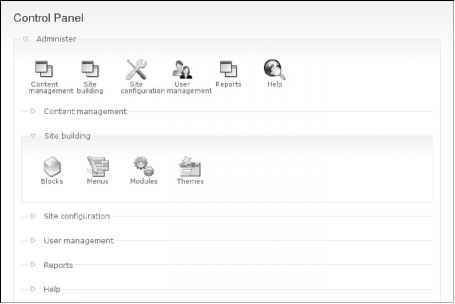 The Control Panel module can be downloaded from the project page at http:// drupal.org/project/controlpanel. Instructions for installing modules can be found in Appendix A. The sample block shown in Figure 8.14 uses the default menu for Administer and contains links to Content management, Site building, Site configuration, User management, Reports, and Help. Although the display is not perfect, altering the titles of the longest menu options tightens up the display significantly as shown in Figure 8.15. Instead of changing the names of the menu items, you may wish to build your own custom menus containing each of the options your users will need. FIGURE 8.13 A control panel can be used as a full-page display to replace the main administration home page. FIGURE 8.14 Control panels can be displayed either as a page or as a block. By default, the titles are a bit long for display in most sidebars. To rearrange menu items, grab a drag-and-drop handle under the Menu item column and drag the items (or group of items) to a new location in the list, (Grab a handle by clicking and holding the mouse while hovering over a handle icon,) Remember that your changes will not be saved until you click the Save configuration button at the bottom of the page. FIGURE 8.15 By altering the name of the menu items, the text of the control page is now legible. You can add icons to a control panel by creating PNG image files. These files must be uploaded to the appropriate sub-directory of the images subfolder for the Control Panel module. For example, to have icons available for all available sizes, you must upload the appropriately sized graphics to each of the following directories: controlpanel/ images/16x16, controlpanel/images/24x24, controlpanel/images/3 6x3 6, and controlpanel/images/48x48. Image file names should match the path for the menu item. For example, an image representing the path admin/build/modules should be named admin_build_modules.png. You may also provide icons for paths outside of the administration area by using the same naming convention. For example, an icon for the path node/add/blog would be named node_add_blog.png. 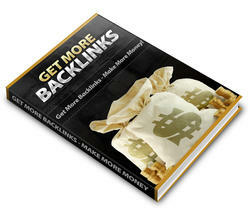 The strategies revealed within the Backlink guide are fast acting, simple and guaranteed to work even if you have never been successful with building backlinks before OR if you haven't even heard of backlink traffic generation for that matter.